Requirements: Compatible with iPhone, iPod touch, and iPad. Requires iOS 2.2 or later. Would you like to find love for Valentine’s Day… or just surprise your boyfriend/girlfriend? 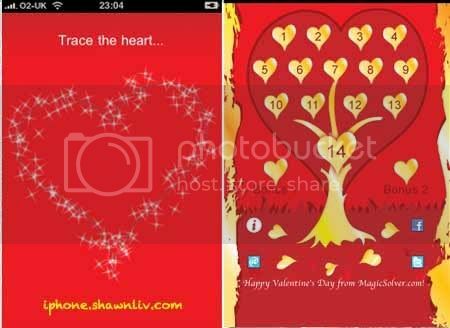 MagicSolver is happy to offer you this selection of the 14 best apps to be ready for love on Valentine’s Day. Among an ocean of over 300,000 apps on the App Store, MagicSolver has picked the best 14 free apps to surprise your love on Valentine’s Day… or to find your date in 14 days if you are single. – Discover a new present every day, a free app from very talented developers across the globe, to find the right one and impress him or her. – Enjoy a selection of great melodies to get in the mood. Just shake your iPhone to change the tune! We hope you get as much pleasure from discovering each app as we did – you’ll get some great tips too. Send us an email or post a review to share your Valentine’s experience with us. Enjoy this free little app! Other post that related to Valentine 2011, Click Here! Check out Love Booth (it’s FREE), a Valentine’s-themed Music and Dance Video eCard Maker, where Cupid, Teddy Bear and Silly Heart dance to holiday card-inspired scenes and your favorite music. The way it works is that you add your own face, custom message, and in a click, you can share the scene as a Video eCard (complete with music), with friends and loved ones; and that video can easily be posted to Facebook, YouTube and the like. FWIW, it’s by the same folks who made Santa Dance, a holiday-themed music and dance visualizer that hit Top 15 during the holidays. Thanks for sharing this awesome app. I am impressed by “Love Booth” application. It has lots of Valentine’s-themed Music and you can create Video Dance eCard with this application.